This Friday and Saturday I went to the Formula Zero which is the very first zero emission championship with go karts also this is the very first race ever. The plan with this championship is to evolve from go karts to bigger cars that are comparable to F1 cars. This is such a cart and this is built by the Formula Zero crew while the competing teams are all build by students all across the world. At the moment there are teams from Great Britain, Spain, Belgium, The Netherlands and America, and America is the only country who has two teams. The Dutch crew are all students from the Technical University of Delft, which had won this weekend 6 lap race and also the visitors vote for best design. The sprint race was won by the Spanish team who did a marvelous job. Also Bright magazine had a vote for best design which was won by the American team, which looks very cool, however it did not rode any laps or compete with the races. This champ also have a certain point system which got to do with the zero. The top place on the podium isn't one but zero, and the winning team get zero points. This means the best team with lowest point will win the championship. This is the best shot of the day with nice lighting of the sunset. Actually it didn't attract allot of visitor, the most people were just walking by to get on to the Spido boat which sails around the waters in Rotterdam showing different views of Rotterdam. 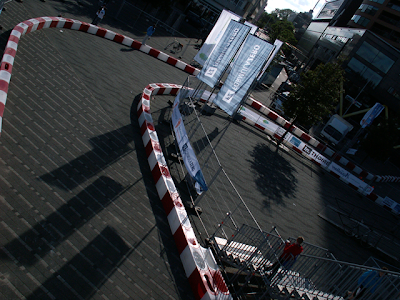 This shot above is taken from the stairs which you could walk above the circuit to get out of it. The funniest shot of the day is this guy from the UCLA crew who ran to the kart that stalled and had be pushed back to the pits. 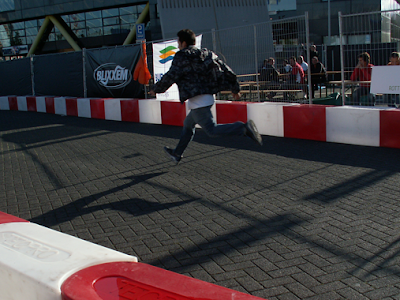 He ran that fast that he had both feet's of the ground. 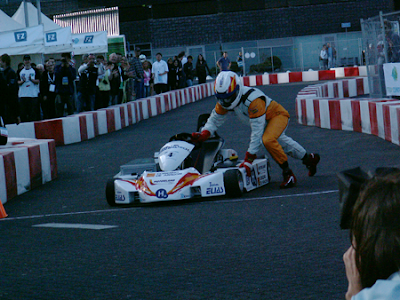 This is one of the harsh moment when the kart stopped just before the finish and the driver had to get out and push it over the finish. 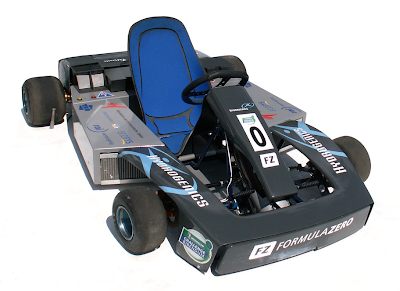 There are still few child sickness with the fuel cells in the kart when the ride of a too high peak for a long time the software will stop the engine and will take a while till it starts up again. Will post more pictures of this event soon for in my photography section. 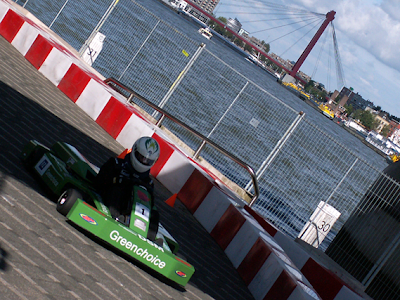 For more info or if you want to join this championship with your own fuel cell kart go to FormulaZero.nl .